If your door is sticking, squeaking, lifting, or lowering slowly, or otherwise just not moving right, you may be in need of new springs. Repairing or replacing springs can be difficult, dangerous work because of the tension required on those springs. Before you attempt any home repairs, let our fast, courteous technicians utilize their years of experience to make your repair experience a safe one. 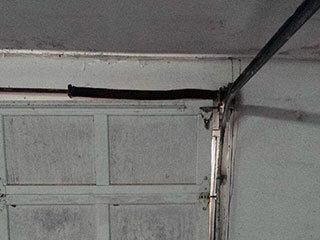 One of the two main kinds of springs used in modern garage doors is a torsion spring. Torsion refers to the twists in this spring that store the energy to operate your door, much like the twists in the spring on a clothespin. The coils are mounted above the door, and are twisted when the door lowers. When you open the door, the energy in the twisted coils provides the strength to raise it back up and counterbalance the weight. The shear force found in torsion springs is less strenuous on the coils than compression and extension, so these springs tend to have a longer lifespan than extension springs. The other kind of spring you may find is an extension spring. Rather than relying on twists or shear force, an extension spring works by compressing and then extending its coil. Continuous use, whereby the springs are stretched out and pushed back together nearly every day or multiple times a day, is very demanding on the springs and leads to a faster burnout than torsion springs. Extension springs will need to be replaced more often - once broken, a spring cannot be repaired. Whatever type of spring you have, our professionals at Garage Door Repair Plymouth can provide the technical knowledge as well as the appropriate equipment for a speedy and safe repair. Instead of risking injury and frustration, let our world-class professionals do it fast, do it right, and do it safely.